Howard Bald recounted life at turn-of-the-century Ojai in these articles from 1972. Much has been written over the years about leading citizens of the Ojai Valley and their contributions to the community. What I propose to do is to try and present a picture of the everyday citizen, something of what life was like at the turn of the century and the decade that followed, of some of the industry and activities that have long been forgotten. Unfortunately, there are not many left to help me on points that have become dim in my memory. I trust, though, that there will be no more inaccuracies in my statements than there have been in statements made by people who are better qualified to be historians than I am. For instance, at the dedication of the new post office a few years ago it was stated that the new building stands on the same spot the post office stood at the turn of the century. Another person in her memoirs stated that Ojai (Nordhoff) never had a saloon. Also the Ojai newspaper wrote an account of Mr. Gridley murdering a Basque sheepherder in the Sespe. All of which I know to be absolutely inaccurate. But more on those subjects later. Now it is not my purpose to start right in criticizing others, but to show how easy it is to make misstatements. I will doubtless make my share of them. 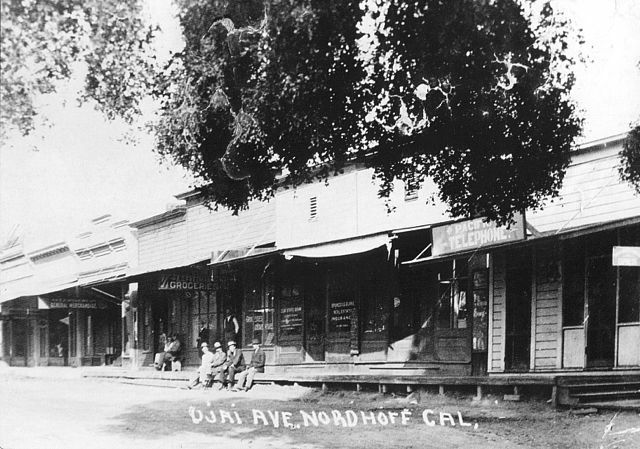 Arriving in the village of Nordhoff (Ojai was Nordhoff until the time of the first World War) in the spring of 1900, I was a scrawny, squint-eyed eight yar old with a supposedly short time to live because of TB. The long severe winters of northern Washington and Idaho kept me wrapped up in bed a good part of the year, so a mild climate with plenty of freedom was recommended by the doctors. Well, I took full advantage of the freedom and in that way gained a wider knowledge of what was going on than the average boy of that time. One of the things that stands out in my memory was the Nordhoff train. It was not until I had grown up that I realized that the train had arrived only two years before my arrival in the Ojai Valley. Two trains plied between Los Angeles and Nordhoff. As the train left Nordhoff at 6 am, its sister train left Los Angeles. They crossed at Moorpark, where the crews had their lunches, then continued on to their respective destinations. So each train took 12 hours to make the one way journey. On long summer evenings one popular source of entertainment for certain men, boys and dogs was to sit on the board sidewalk, where the arcade is now, and at the sound of the train whistle down near Grants Station [where Rotary Park is now], all would take off on a trot for the [Nordhoff] Depot. Near Schroff’s Harness Shop (where the Ojai Cleaners now is) we cut down Montgomery Street and below the lumber yard, now Wachters, we went across to Fox Street. 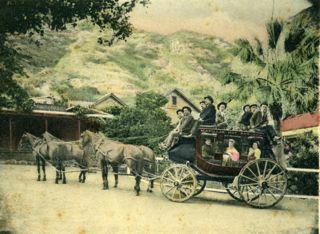 At the same time the Matilija Hot Spring’s big lumbering overland stage, driven by either John Oretega, Bill Olivas (father of the Billy Olivas who is currently making headlines at Matilija Hot Springs) or Bob Clark would wheel in a cloud of dust, followed by Wheeler Blumberg with his four white horses hitched to a four-seated buckboard. 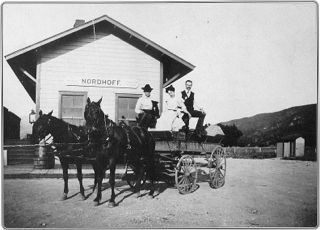 Nordhoffâ€™s taxi, which comprised a team of horses attached to a buckboard, would be there along with an assortment of country folk with a horse and buggy to meet incoming friends or family. As the train crossed S. Ventura, S. Montgomery and Fox streets huffing and puffing, with steam jetting from both sides and the bell clanging, there was general pandemonium, for many of the country horses were terrified of such a monster and resorted to lunging, bucking and rearing. Not infrequently would be heard snap of a buggy shaft or a wagon tongue amid the barking of dogs and shouting of women and children on the ground greeting incoming family. When the Matilija and Wheeler Hot Springs guests were all loaded there would be a popping of four horse whips, as the stages departed through town on a dead run. In later years I have wondered just when the horses settled down to a jog trot, for certainly they couldn’t endure such breakneck speed for long. Finally as broken harness and buggy shafts were mended and the more terrified horses were led out across the bridge and all the passengers had departed, the boys and dogs would straggle off to their respective homes and the men back to their visiting along the boardwalk or to Dave Raddick’s pool room. I don’t believe the patron’s of John Lagomarsinoa’s card house were ever diverted from their evenings carousel by the arrival of a train. The building in the above photo titled “The Taxi” is the old train station. It was located between Fox and Bryant streets. If I recall correctly, it was a tad nearer to Bryant Street. When I was a boy (1950’s to ’60’s), we lived on E. Aliso Street, then moved to E. Matilija Street. Occasionally, a few of us boys would cross Ojai Avenue, then walk down Bryant Street to the closed-up train station. I can remember climbing up onto the high porch that ran along the side of the building that would have faced the train. I don’t remember us doing anything mischievious there. We just thought it was kind of cool place to check out. I’ve often thought that somebody with a metal-detector ought to go to the former site and see if they can find any old coins, jewelry or the like. I hope Mr. Mashburn will come to the Town Talk on Sept. 18 at the Museum to hear stories about planes, trains and automobiles and to tell his stories about the train station and any other experiences with the transportation in Ojai. Thank you for the invite, but I work weekends and, therefore, will be not be able to attend the Town Talk on Sept. 18th. I’m certain that the event will be quite informative and very fun! Here’s a bit of transportation trivia concerning me. When I was 12 years in old in 1963, my folks moved into the new home they had built at 1924 South Rice Road in Mira Monte. Us neighborhood kids could easily walk across the many English Walnut orchards to the Henderson Airfield that used to be located on the corner of Highway 33 and Highway 150 (Baldwin Rd.). At that very corner of the airfield was a 1940’s two-seater Aronka Champion fixed-wing airplane that had a sign posted on it’s window stating, “Airplane Rides $8.00”. I had never flown in an airplane, so I knew this was my chance. My best-buddy (Mark Madsen) and I were able to scrape together eight-bucks between us. We figured the pilot would let us cram ourselves in the single-seat rear passenger compartment. We told him our plan and he insisted that we each had to pay him $8. We kept hounding him daily with our plan and told him we just couldn’t come up with any more money. After about two weeks of us bugging him, I remember he threw his hands up into the air, raised his voice at us and stated something like, “Alright, alright! But, it’s going to cost you eight dollars and I mean not a cent less! And, you must bring your parents here or get written permission from them.” A few days later, we showed up meeting his conditions, ready for our flight. We gave him our hard-earned $8.00. Just before he opened the plane’s door he asked how much we each weighed. We told him. He said,”Well, that’s over the weight limit.” I thought my first flight was doomed. But, the pilot said, “It’s only a little over-weight though and it’s gonna be tight in the seat.” In we went. The pilot fired up the plane and taxied out onto the oiled dirt airstrip with the barbed-wire fence and Highway 150 to our rear. We slowly and bumpily headed southwards down the chuckhole-filled strip towards Mirror Lake. As Mira Monte Market (now Rite-Aid) passed, I thought we might wind up in the lake. It sure didn’t seem like we were going fast enough to go airborne, but near the end of the strip………….off we went into the wild blue yonder. It was breath-taking! The pilot flew us over the Ojai Valley for about 20 minutes and pointed out places like Ojai Avenue, Soule Park Golf Course and Lake Casitas. At one point, he flew the plane like a roller-coaster climbing up, then descending. He did this manuever several times in a row which made me a little green around the gills, but I wasn’t going to complain on my first airflight or in front of my buddy! It was a spectacular adventure that I will never forget. I had a similar “hair-raising” experience in 1969 when taken for a joyride around the Ojai Valley by Ojai principal Marty Young. Shortly after take-off from Henderson Field, I spied my house below. When I pointed it out to Marty he shouted, “Let’s do a strafing run!” and down we went just like the Red Baron.